Home / Public Protection / Media / News / We got silver. Yes! You are probably doing what you can to reduce your environmental footprint. Right? 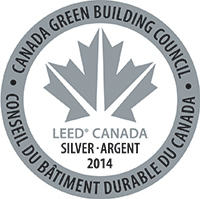 The College office space was recently awarded LEED silver certification by the Canadian Green Building Council. Our Toronto office includes eco-friendly practices consistent with the requirements of the LEED program in terms of sustainable site development, water efficiency, energy efficiency, materials selection, indoor environmental quality and innovation.